Influencer marketing is a powerful tool to help grain greater credibility from your audience and expand the reach of your content. But while many marketers extol the ease of creating such programs, it seems they have limited real-world experience creating them. 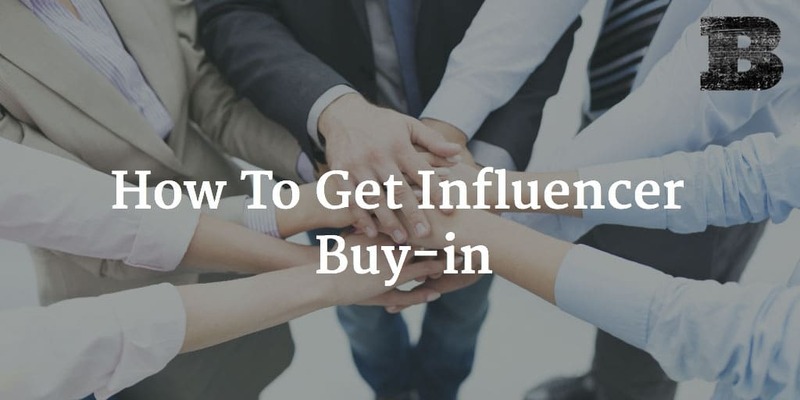 After the challenges of identifying ideal influencers for your project, the outreach and getting influencer buy-in can pose a number of challenges too. Getting buy-in is critical. Without it, you’ve got no influencers, and without strong buy-in they’re less likely to be wholly committed to the project, helping to amplify and assist in seeing it greater success. Buy-in is a challenge. But with an understanding of what it takes to get influencers sign-on, you can see far better success at getting influencers to take part in your projects and the overall influencer marketing project. Here’s how to get influencer buy-in. When marketers give advise about influencer outreach, it seems many have never worked an influencer project outside of the marketing world (projects where the influencers are other marketers). They don’t understand that marketers are motivated to participate in influencer projects far more easily than other professions. As marketers, we love self promotion. It’s why we build active social profiles, blog frequently, and do anything we can to promote ourselves. Little is required to get marketers to be part of an influencer piece, as their reward is generally just being part of something that gets their name out there and paints them as an expert. But not everyone is inspired to take time out of their busy lives to give to an influencer project for the same small bit of self-promotion in return. For many, having their name in an ebook or blog post isn’t enough to be worth their time. Their name is already well known or they work in an industry where it’s not that important (why does an IT worker or retail salesperson care about having his name in an ebook). What would be reason enough to take part for a marketer may not be enough for many others. You need to find what inspires each group and even each potential influencer. You’re done identifying the right influencers for your project. Now it’s time to reach out to them and see if they’d be interested in being part of it. But before you do, take the time to figure out what will inspire each to take part. Consider both who they are and where they work. Is simply seeing their name somewhere going to make them give you the time commitment or do you need to provide something more? For some, simply wording your proposal differently is enough. Appealing to their own ego can be the key to getting their buy-in. Letting them know their contribution will be seen by hundreds or thousands of like-minded professionals may better sway them than just saying they’ll be part of a blog post on XY topic. Maybe explaining that being part will position them as a thought leader in their field can help them see stars and climb aboard. Think about how you can appeal to the areas each person finds most rewarding and craft your message to address those areas. In some cases, simply being part of a project or having their name appear with other thought leaders isn’t enough to compel people to take part in your influencer marketing projects. Appealing to their ego isn’t going to be enough. For some, you may need to consider another sort of compensation. This could be in the form of backlinks to their own content from your site, featuring them in future ways, or other benefits for them. These are best offered at the time of the initial outreach as they increase the chances of a quick ‘yes’ and make the influencer see the value in taking part upfront. Even if you choose not to offer these added incentives upfront, consider your options ahead of time so you can reply with the offer quickly, should the potential influencer waiver on committing to the project at first. Some may ask for monetary compensation or gifts, but doing so makes your piece no longer an influencer project but instead a paid advertisement. The FTC guidelines also require any such gifts or compensation to be made very clear to all viewers. This would take away much of the credibility of the influencer provided piece. For these reasons, it’s recommended that you stay away from any type of financial or gift compensation when working with influencers. Getting influencers onboard doesn’t have to be difficult if you take the time to find what will most persuade them to see your project as a worthwhile endeavor. By considering what inspires each group and individual, you can increase the odds that they’ll happily take part in your marketing effort. Think about how you can make your pitch more intriguing to potential influencers. Make them an offer they can’t refuse.